See also: Revision Skills and Learning Styles. For some time now, many of the qualification systems around the world have focused on coursework (essays, assignments or other homework that is completed outside of the classroom and counts towards the final mark or grade), with a smaller component of each qualification being based on examinations. However, in the UK at least, the pendulum is now swinging back in the opposite direction, with more emphasis on examinations. The skills required to pass examinations are quite different from those required to excel in coursework-based study. In particular, revision skills are vital, but acquiring them often takes time and a bit of trial and error, which may mean that you get lower marks in one or more exams than you’d like. This page provides some ideas about how you might develop suitable revision skills. Revise v.t. to study anew, to look at again; revision the act or product of revising. Revision, then, is looking again at something that you have previously studied, usually with a view to learning it in order to pass an exam. 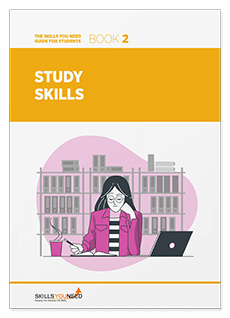 Our study skills pages contain much that is useful for revision as well as study more generally, including the importance of getting organised for study, finding time to study, time management, and avoiding distractions. Perhaps the most important aspect to successful revision is being honest with yourself. This may be the first time that you have had to sit down and organise your own study without anyone checking what you’re doing, and it is important to stress that it is no use telling yourself that you are revising if you are not. Sitting at your desk staring out of the window does not count as revision, even if your books are open in front of you. Technically, neither does drawing up a beautiful colour-coded revision plan, even though it may help your revision planning. Be honest about what you are doing. If it is useful and vital preparation, then go ahead. If you are doing it in order to postpone the evil moment that you will actually have to do some revision, then stop it and get on with your revision. Now. You will feel better once you have started to revise. Really. Just getting half an hour of actual work done will feel so much better than the ‘black cloud’ worry of ‘I still haven’t started my revision and the exams are only x days away’. Go on. Just do it. Some days you can work for two hours solid, without a break. Other days you will be struggling to manage 20 minutes without being distracted. Sometimes this is about the subject that you’re doing. Sometimes it’s just about your biorhythms, and/or how much sleep you had the night before. And sometimes, if you’re honest, it’s about just not wanting to work. Find the balance between beating yourself up and being self-indulgent. If 20 minutes is a struggle, reward yourself for half an hour’s work with a 5-minute break, but no more. If you’re good to work for an hour, reward yourself with 10 minutes’ break after that. If you manage longer, the breaks can be longer too. Changing subjects can keep you going for longer as well. After all, variety is the spice of life! However long you normally study for at a time, remember that you’re going to have to sit still and silent for the length of the exam. If your exam lasts two hours, make sure you’ve spent at least a few revision sessions sitting still and working for that long, so that you know that you can do it. Revision doesn’t just have to consist of sitting reading over your textbooks or notes. There are plenty of other activities that you can also do. Your school or college may have organised study or revision classes, which may be worth attending, but you could also organise your own. Why not get a group together to discuss an aspect of one particular course that you all find interesting and/or difficult? If you’re on study leave, the chances are that your teachers will have lighter timetables than usual, so might be prepared to facilitate an extra discussion group and keep you all on track. There are almost always past papers or sample papers available, either through your school or college, or online. If you’re finding it hard to concentrate on reading, why not work your way through a practice question or two? There are also plenty of resources online, such as example answers. Ask your school or college for some ideas for suitable sites, or look at their learning centre or VLE. If you’re bored with writing your own answers, critique a sample answer, and see how you could have improved on it. Ask your teachers or professors if they agree with your improvements and what more you could have done. If today just isn’t your day for revising, and you really can’t settle to anything, then take a break. But don’t just sit around looking at Facebook, or distracting your friends from their revision by messaging them. Set yourself a time limit, maybe an hour, maybe two, and do something constructive. Take the dog for a walk in the park, or go for a swim at the local pool. Fresh air is very good for concentration, and exercise will help your brain relax. Or do some cooking: maybe make supper, or bake a cake. When you’ve finished, go back to work and try again. You’ll probably find the break and distraction have done you good and you can think more clearly. You can be revising all day, and feel exhausted, but still be unable to sleep if you haven’t taken very much physical exercise all day. Try to balance mental and physical activity, even if your physical activity is only a walk around the block at the end of the day. If you can take some real exercise periodically, a run, a swim, a bike ride, or a decent walk, then do. You will feel better, and work better, for it. You need a chance to switch off before you try to sleep at the end of the day. Don’t stop revision and go straight to bed, but give yourself at least an hour in between. Research suggests that it may be even worse to stop revision and turn straight to the internet or TV, because there is evidence that the light of the screen switches off the neurotransmitter that helps us to sleep. Instead, find something non-screen-based that helps you to relax and do that for a while. You will sleep better, and wake better able to face another day’s revision. See our page How to Sleep - The Importance of Sleep for more information.